If you already knew about (or read our item on the perils of fracking), you may well be asking yourself: If this method of extracting natural gas is not the answer to our energy needs— and if nuclear is not either— then what to do? This seems like a good time to remind that there are some intriguing ideas out there. One place to start is an essay by two professors, Mark Z. Jacobson and Mark A. Delucchi, published in Scientific American a little over a year ago. It’s “A Plan to Power 100 Percent of the Planet With Renewables.” By 2030. One of the great things about Scientific American, besides the articles, are the lively and thoughtful debates that take place in the comments, with knowledgeable readers sharing their information and the authors responding. Whatever you think of the practicality of the approach these two men take, at least it’s a start to a conversation we need to have—right now. …Our plan calls for millions of wind turbines, water machines and solar installations. The numbers are large, but the scale is not an insurmountable hurdle; society has achieved massive transformations before. During World War II, the U.S. retooled automobile factories to produce 300,000 aircraft, and other countries produced 486,000 more. In 1956 the U.S. began building the Interstate Highway System, which after 35 years extended for 47,000 miles, changing commerce and society. …In our plan, WWS [wind, water and solar] will supply electric power for heating and transportation—industries that will have to revamp if the world has any hope of slowing climate change. We have assumed that most fossil-fuel heating (as well as ovens and stoves) can be replaced by electric systems and that most fossil-fuel transportation can be replaced by battery and fuel-cell vehicles. Hydrogen, produced by using WWS electricity to split water (electrolysis), would power fuel cells and be burned in airplanes and by industry. … Even if demand did rise…WWS sources could provide far more power. 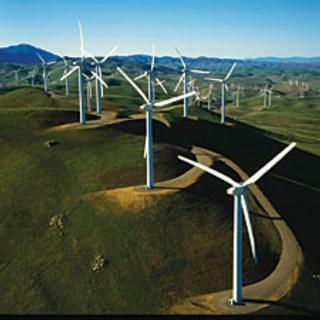 Detailed studies by us and others indicate that energy from the wind, worldwide, is about 1,700 TW. Solar, alone, offers 6,500 TW. Of course, wind and sun out in the open seas, over high mountains and across protected regions would not be available. If we subtract these and low-wind areas not likely to be developed, we are still left with 40 to 85 TW for wind and 580 TW for solar, each far beyond future human demand. Yet currently we generate only 0.02 TW of wind power and 0.008 TW of solar. These sources hold an incredible amount of untapped potential. … Only about 0.8 percent of the wind base is installed today. 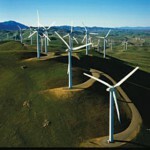 The worldwide footprint of the 3.8 million turbines would be less than 50 square kilometers (smaller than Manhattan). When the needed spacing between them is figured, they would occupy about 1 percent of the earth’s land, but the empty space among turbines could be used for agriculture or ranching or as open land or ocean. The nonrooftop photovoltaics and concentrated solar plants would occupy about 0.33 percent of the planet’s land. Building such an extensive infrastructure will take time. But so did the current power plant network. And remember that if we stick with fossil fuels, demand by 2030 will rise to 16.9 TW, requiring about 13,000 large new coal plants, which themselves would occupy a lot more land, as would the mining to supply them…..
…WWS technologies generally suffer less downtime than traditional sources. The average U.S. coal plant is offline 12.5 percent of the year for scheduled and unscheduled maintenance. Modern wind turbines have a down time of less than 2 percent on land and less than 5 percent at sea. Photovoltaic systems are also at less than 2 percent. Moreover, when an individual wind, solar or wave device is down, only a small fraction of production is affected; when a coal, nuclear or natural gas plant goes offline, a large chunk of generation is lost. …Today the cost of wind, geothermal and hydroelectric are all less than seven cents a kilowatt-hour (¢/kWh); wave and solar are higher. But by 2020 and beyond wind, wave and hydro are expected to be 4¢/kWh or less. For comparison, the average cost in the U.S. in 2007 of conventional power generation and transmission was about 7¢/kWh, and it is projected to be 8¢/kWh in 2020. Power from wind turbines, for example, already costs about the same or less than it does from a new coal or natural gas plant, and in the future wind power is expected to be the least costly of all options. The competitive cost of wind has made it the second-largest source of new electric power generation in the U.S. for the past three years, behind natural gas and ahead of coal. Solar power is relatively expensive now but should be competitive as early as 2020…. These are serious people proposing serious, if extremely bold and challenging, solutions. It’s not enough to pooh-pooh such ideas, to poke holes. They need to be treated as seriously as the current plan. Which is extinction.